My first week nearing the end has been a productive one. The first thing I did was set up this blog website so that all of you could read my journey as we are all reaching the end. This part was fairly easy as I had an online class this past summer where we had to create a website just like this that had WordPress downloaded onto it. The second thing I did was set up an Instagram, Twitter, Slack, and SoundCloud just for this class. I have my own personal Instagram and Twitter, but I decided to set up one just for this class as it will be easier to put up posts relating to The End 106. I added some items into our bunker. These items were combat boots as the world might be a little rough and we will need some durable shoes to get around. I also put in a fire starter and protein bars, so if we need to start a fire we will have something to help us get one faster, and if we get hungry a protein bar would be perfect to give us some energy. I read about apocalyptic and post-apocalyptic fiction on Wikipedia and that definitely gave me some more knowledge on both of them as my understanding of both was limited. My own personal relationship with apocalyptic and post-apocalyptic fiction is that I don’t mind it, but I haven’t always been a big fan of it. I have never been super interested in alien invasions or zombies, as those things could potentially happen in real life but it is very unlikely. As it is fiction, it is not real, and I think that is why I have a hard time really liking these things. There is one show that I absolutely love and has resonated with me and it is The 100. This show is one of my favorites and it is about a nuclear apocalypse that destroyed civilization on Earth. There are only 4,000 people living and they are living in space. The problem is that they are running out of oxygen up there, so they send their 100 teenage prisoners down to Earth to find out if Earth could potentially be livable and to see if people would react badly or die from radiation. Then it gets crazy from there. That show has resonated with me because a nuclear apocalypse is something that could happen in the future. I don’t know if people could live in space, but the show is just so interesting. A nuclear apocalypse is the type of apocalypse that is particularly interesting to me, just because I feel that it could really happen one day. 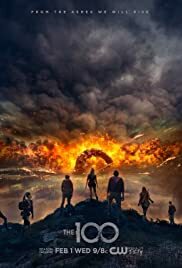 I think I also have the show The 100 to thank for that, because it is one of my favorite shows.